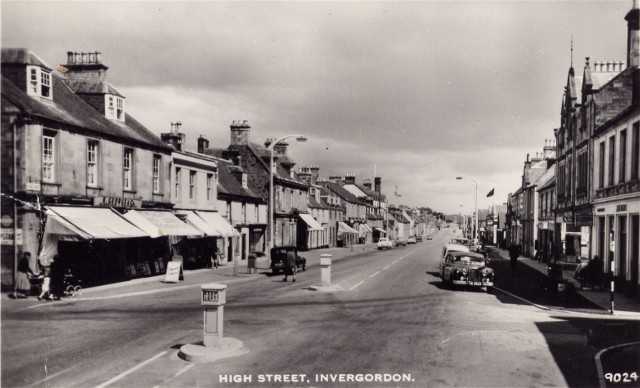 The High Street in the early 1960s. Study of the cars parked helps to estimate the date. The Mark VIII Jaguar parked on the right is rather nice. Note that the fountain has been removed. Eddie, the Jaguar has the Registration No. NS 3823 and is either a Mark VIII, introduced in 1956, or a Mark IX, introduced in 1959. So your dates are spot on! What a gorgeous car! Think that Jaguar belonged to Robert Kerr's Dad (Rosskeen). That puts the photograph about 1955-58. Great car, comfortable leather seats.